Once you landed on Dubrovnik airport, there are several options of reaching the city of Dubrovnik. 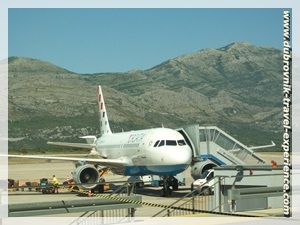 The airport is situated 20 km southern of Dubrovnik in Konavle region. The cheapest solution is to take the airport shuttle bus which waits for passengers from every scheduled flight outside the arrivals terminal. A one-way ticket is 45 HRK while a return ticket is 70 HRK. Bus tickets can be purchased from the Platanus travel agency counter at the airport. The bus ride to Dubrovnik is around 30 minutes. You can get off the bus at Pile Gate which is western entrance to the Old Town or main bus station in Gruz. From Pile Gate you should catch a city bus if you stay in Lapad, Babin Kuk or Montovjerna. Another option of travelling from the airport to the city is to take organized shuttle transfer (air-conditioned and comfortable mini van) which will take you directly to you accommodation. If you seek for the fastest and the most comfortable way of reaching Dubrovnik or any other destination in the region (Cavtat, Orasac, Korcula, Peljesac, Split, Kotor, Herceg Novi, Medjugorje, Mostar) from the airport you should book a private transfer. The English speaking driver will wait you at arrival terminal, assist you with your luggage and drive you directly to your apartment or hotel. This way you don't have to worry about finding taxi, negotiating the price or wasting your valuable holiday time. There is also a taxi rank just outside the airport building where you can catch a regular taxi to Dubrovnik.